A new report is sounding the alarm on the state of Canada's fisheries and says the federal government must act now to stall or prevent the severe depletion of several marine stocks. In its first annual Fishery Audit, released Wednesday, Oceana Canada examined 194 fish stocks across the country and found that only a third can be considered healthy. Another third lack sufficient data for an assessment, and 26 stocks are in critical condition, meaning their total biomass has fallen below 40 per cent of the maximum sustainable yield, or the amount of fish that can be taken from the ocean without compromising the population's ability to replenish itself. "There is a continuing crisis in our fisheries," says Robert Rangeley, science director for Oceana Canada, the Canadian arm of an international advocacy group dedicated to ocean conservation. "We’ve got to measure what’s there, and then manage them and allow them to rebuild." The audit builds on previous efforts by Oceana to capture a complete picture of the health of Canada's fisheries — something that has become easier as transparency has improved under the current federal government. However, Rangeley says Fisheries and Oceans Canada must now follow through on its commitments to develop rebuilding plans for five more critical stocks by 2019. Currently, plans are in place for just three of the 26 critical stocks flagged by Oceana. In Atlantic Canada, which has the lion's share of critical stocks in Canada, only Atlantic cod has a rebuilding plan. If action is not taken soon, Canada stands to suffer serious economic and environmental consequences, Rangeley says. "Right now, four species — lobster, crab, shrimp and scallops — make up most of the $3 billion landed value of our fisheries. Fin fish – cod, mackerel, plaice — contribute relatively little, and they’re at cautious or critical status. That's a big missed opportunity," Rangeley explains. "It’s important to have that diversity of opportunity and be able to switch between fisheries when there are inevitable ups and downs in the stocks, so people can have jobs and stay in their communities." According to the audit, more than half of Canada's fish biomass has disappeared since the 1970s. That has a cumulative impact on the ocean's resilience in the face of environmental change. "You’re changing all sorts of predator-prey relationships, the very function and structure of the ecosystem, and now we have new threats to our oceans: climate change and ocean acidification," Rangeley says. "A diverse ecosystem is a healthier ecosystem, but if it's already depleted, it won't withstand those shocks to the system." Vance Chow, a spokesperson for Fisheries and Oceans Canada, said the department welcomes Oceana's audit and is reviewing the recommendations within it, which include legislation mandating the rebuilding of depleted fish stocks and a policy that would require all commercial fisheries to accurately report their retained and discarded catch. "Ensuring the protection of Canada’s ocean ecosystems is a priority for Fisheries and Oceans Canada," Chow said in an email, noting the department is already spending $24 million annually on fish stock research and has committed an additional $3.75 million for the completion of fishery management and rebuilding plans. 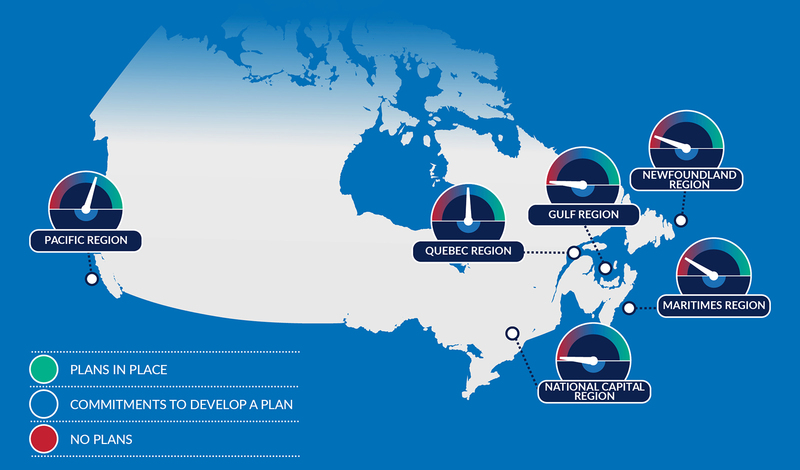 "We’ll continue working to further improve the science and management of Canada’s fisheries." Rangeley says Oceana Canada plans to conduct its audit annually to monitor the government's progress on its commitments. "Our recommendations are pretty straightforward," he says. "They're not easy to do, but it’s what has to happen for well-managed fisheries, and those are the things we’ll be continuing to check in on. If we do these things, we’ll start seeing the needle move."